Well, it’s been a while since I’ve had time to lift my head and do any kind of series on exercise physiology, having instead been confined (happily, I might add) to current affairs in the world of sports science and management. It is the story of 60 year-old Yoshihisa Hosaka, who broke an 18-year old record for runners aged 60 in the Beppu-Oita Mainichi Marathon. It is one of many stories of remarkable running feats in the aged population, I’m sure that you have many as you read this. The effect of aging on running. What I will try to AVOID in this series is the overdone discussion of the physiology of aging. That’s been done many times – you can, for example, find a decent presentation on it here, courtesy John Puxty of Queens University. There are many other similar sites and books, so we won’t simply repeat what is already known. Obviously, it is important, and will come up as the explanation for what is observed, but I’m more interested in digging into the issue a little more and discussing why some older runners keep running fast, and why others can’t. What is it that allows Yoshihisa Hosaka to run a 2:36 marathon, or Ed Whitlock (see his story below) to run a sub-3 hour marathon at the age of 70? And why do 999 out of the other 1000 runners struggle to keep running, let alone break 3 hours? These are the more fascinating questions regarding aging and exercise. Unfortunately, they are unanswerable, so that leaves much room for speculation and theorizing. Fortunately, that’s always fun, so this should lend itself to great discussion! It also lends itself to fascinating case studies of extra-ordinary runners, so let’s see what can be dug up! In green at the bottom, I’ve oversimplified the analysis by showing the percentage decrease over the decades from 30 to 40, 40 to 50, 50 to 60 and 60 to 70. It’s clearly not a linear decline, and it’s “cheating” to break the curve down into four linear blocks. A more detailed statistical analysis is needed, but for now I just want to make the point that the decline accelerates as you move further and further along. One would expect this kind of pattern, because as we age, performance is one of many variables than changes, and factors not related to exercise start to “filter” out the eligible population towards the right of the graph. By the time you get to the 80s, the main determinant of sports performance is health (which may be related to nature as well as nurture!). There are some fascinating people represented by those blue diamonds. Over the course of the next few posts, I’ll pick up on some of those people, but for today, two stand out. 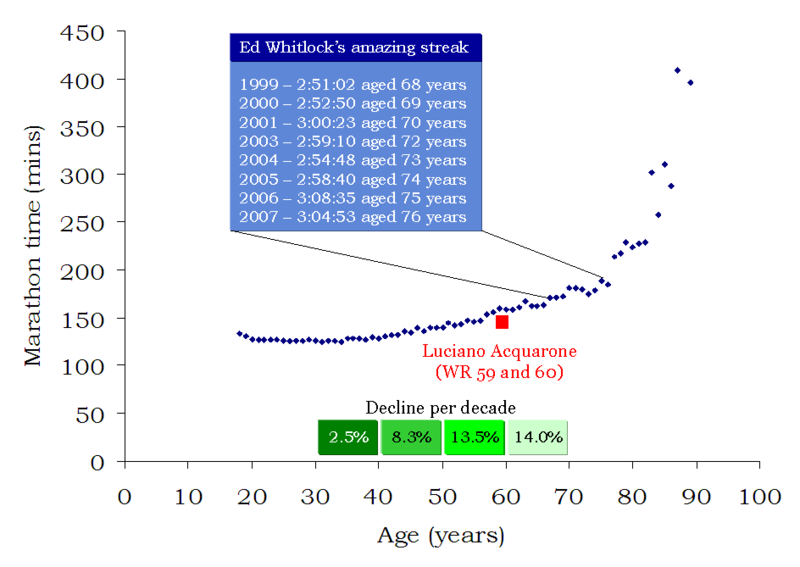 First, there is Luciano Acquarone, the world record holder at 59 years (2:39:13), and the FORMER record holder at 60 (2:38:15 – his record was broken in Japan), who I have highlighted in red on the graph. The reason he is fascinating is not only because he was clearly a great 60 year old runner. What intrigues me most about him is that he doesn’t hold any other records beyond 60. So what, you say? Well, take the case of Ed Whitlock, who I’ve also highlighted. Whitlock is a Canadian runner who began his record spree at 68, and holds every record between 68 and 76, with the exception of the 71 year record. Whitlock was the first man over 70 to crack 3 hours for the marathon. We’ll discuss him in more detail in the future. What jumps out at me is that Whitlock is “only” 8 years older than Acquarone, yet in those 8 years, there is a 20 minute difference in performance. Which means that Acquarone has “lost” 20 minutes, a much larger gap than would be expected according to the traditional decline in performance. Ages hit the headlines last year as well, and it wasn’t because a 60-year old produced a 2:36 performance. Rather, it was because the two greatest marathon runners in the world at the moment lie on quite opposite ends of the age spectrum, at least according to conventional wisdom. Haile Gebrselassie is 34 years old, and since he turned 32, he has run the three fastest marathons in history. This ‘hat-trick’ of sub 2:05 performances comes as the latest achievement in a career that has really been going since 1993, when he won world junior titles over 5,000 and 10,000m. A 19 year career at the elite level (I’m not even counting his debut marathon at 16, since he wasn’t elite then). His longevity is remarkable, given that “conventional wisdom” suggests that most elite runners have perhaps ten great marathons in them, and only five to six years of elite running. Sammy Wanjiru, on the other hand, is an “infant”, having begun his marathon career at the age of 21. And while his career has a long way to go to match the career of Gebrselassie, he is, in my opinion, the current number 1, with a 2:05 clocking in London, and perhaps the greatest marathon ever run in Beijing’s heat – a 2:06:32. He bucks “conventional wisdom” by producing those performances despite being “too young”. And herein lies the problem with conventional wisdom – it’s often wrong. To take two men and use them as proof of the wide age at which marathon success can occur is obviously misleading. But it’s equally wrong to suggest that there is a narrow window and a ‘limited lifespan’ of a distance runner (or any other sport, for that matter), because for every rule, there are exceptions (often, there are many). And so what we’ll see in this series is that there is no formula, no known way to predict sports longevity, and athletes who defy nature and aging to keep producing as they get older. But equally, there are cases that prove the point and confirm the “wisdom”. So we are best off leaving that conventional wisdom behind, and just accepting that for every point made, there is a counter-point, and too many individuals to account for. The problem with science that way is that it often “discriminates” against these outliers, individuals who disprove the textbook physiology. That’s because science generalizes, and averages data, and we scientists love to work out an equation to predict a decline in performance over time. However, in this case, that predicted decline is based on perhaps 50 DIFFERENT INDIVIDUALS, and you’d be completely incorrect to assume that age causes a decline in performance that is predicted by the equation X. It doesn’t work that way. So join us for a series that looks at some rather unusual individuals, with some lessons (hopefully) for all of us!